7 AM on Day 4, the sun is rising behind Kicker Rock (Leon Dormido in Spanish or Sleeping Lion). This island is found off the northwest shore of San Cristobal Island. It is a massive angular rocky block very similar to Gibraltar. Xpedition has dropped anchor and the Zodiacs are being lowered in preparation for a special morning activity. 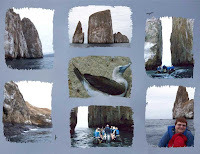 There is only one activity offered: Early Circumnavigation around Kicker Rock - Zodiac Ride Only. Since I'm telling you about this, you guessed it, we did get up early to partake in this activity and are very glad that we did so. Kicker Rock's size alone is impressive but even more interesting is the cliff that splits the rock into a narrow passage. The Zodiacs took us up close to Kicker Rock, also going thru this narrow passage. This interesting formation is referred to as a Tuff structure. Tuff is formed when the ejecta and ash from a volcanic explosion mixes with water vapor. The resulting formation has a cement finish. As we visited this island we saw more sea lions, frigate birds, that we circling high above the rock, and other inter-tidal zone life. We spent about an hour circling Kicker Rock and taking plenty of photos. If you'd like to see more pictures, see our Kicker Rock album. Breakfast was waiting for us in Darwin's Restaruant when we returned to the Xpedition. North Seymour Island is located at the central area of the Archipelago, just north of Baltra. Following the mandatory Life Boat Drill, the ship's Zodiacs began loading passengers for our first activity. There were two options, a High Intensity Activity - Dry Landing at North Seymour Island and a Low/Medium Intensity Activity - Zodiac Ride and Dry Landing. In order to accomodate all passengers, the Zodiacs first drop the groups doing the dry landing on the island and then return for those that opted for the medium intensity activity. You may be wondering what a Dry Landing is. It is exactly as it sounds. You can wear hiking boots or any other sort of comfortable shoes without fear of them getting wet. It is advisable to wear sturdy, yet comfortable shoes and use a hiking stick on most Dry Landings. Those that took the Dry Landing walked on an uneven path which took them inland to observe frigate birds and possibly Land Iguanas. Eventually, they arrived at a beach area where Galapagos Sea Lions, Blue Footed Boobies, and Marine Iguanas were observed. We opted for the Zodiac ride along the coastline which searched for Galapagos Fur Seals, Lava Herons, and Swallow Tailed Gulls. The Geology of this reqion is quite impressive due to the limestone trapped between two layers of basalt lava. Following the Zodiac ride, we too made a dry landing on North Seymour Island where we hiked along a portion of the trail observing Blue Footed Boobies, Galapagos Sea Lions, Marine Iguanas, and Frigate Birds. The male Frigate Birds have red throat pouches that extend to attract the females. Blue Footed Boobies have blue webbed feet. We'll see them again later in the week. The only difference between the two activities was the length of the hike. In both cases, you had a good opportunity to see the inhabitants of North Seymour. Our Cruise Director had joked that we would take our first 300 pictures of Sea Lions during this activity. That wasn't far from the truth since we definitely did see quite a few of them during our visit. View our Galapagos - North Seymour Island album. We boarded our Zodiacs for the return ride to the ship which was anchored nearby. Back onboard, Captain Fausto Pacheco, Master of the M'V Xpedition and his officers welcomed us with a toast which was followed by the briefing of the next day's activities. Our first day in Galapagos had been amazing. There hardly are words to describe our first experience following in Darwin's footsteps. Passengers gathered in Discovery Lounge for a welcome aboard drink and check in. The Guest Relations staff made their way through the passengers to complete the embarkation process. the process went rather smoothly and soon we were off to our cabin and then on to a lunch buffet in Darwin's Restaurant. We had time to settle in before returning to Discovery Lounge for a briefing about the afternoon activities. At 3 PM, Jorge Parrales, our Cruise Director, made a short presentation, explaining the shore excursion we'd be doing later in the afternoon. As was the case most of the time, there were two choices - High Intensity Activity - Dry Landing at North Seymour Island or Low/Medium Intensity Activity - Zodiac Ride & Dry Landing at North Seymour Island. The presentation showed the terrain and the wildlife we were expecting to see. The major difference between the two excursions was the length of the hiking. I'll detail the shore excursion in a separate post. Following the excursion, we returned to the ship, freshened up, and once again met in Discovery Lounge for drinks before dinner. Every evening, around 7 PM, the Cruise Director gives a briefing concerning the following day's activities. At the conclusion of the briefing you then sign up for the activities that interest you. This helps the crew plan for Naturalists and Zodiac crew needed. Dinner was served at the conclusion of the presentation. Other than the extra briefing when we got onboard, this is a typical day aboard the Celebrity Xpedition in Galapagos. 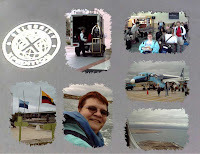 For some more pictures, see our Celebrity Xpedition - Welcome Aboard Album. 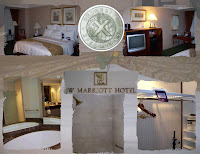 Sunday, August 31st we bid farewell to JW Marriott Hotel Quito for our new home for the next seven days: Celebrity Xpedition. Our luggage was taken to the Quito Airport via truck and we followed by motor coaches. Upon arriving at the airport, we went through security and were shown to VIP lounge where we waited for our flight to Baltra. Our flight was a charter on TAME Airline. We flew from Quito to Guayaquil where we made a short stopover to refuel. On the flight from Quito, we had breakfast which consisted of yogurt topped with cereal. The flight to Guayaquil was about an hour. We landed in Guayaquil and were instructed to remain seated with our seat belts open. This was a security measure incase anything were to go wrong during refueling. It didn't take long for the refueling. Additional passengers boarded our flight. We learned later that they were the naturalists and some crew members. On the flight from Guayaquil to Baltra we were served lunch which consisted of a ham and cheese sandwich. Drinks were available, including wine which was the same wine we'd be served throughout the cruise. Once again, the flight was about an hour. We deplaned and walked to the airport lounge. We checked in with Celebrity and received our Galapagos National Park paperwork and cards. After completing our checkin process, we boarded a bus for a short ride to the site where we'd meet the Zodiacs which brought us to the ship. The first thing we learned was the Galapagos handshake. Everytime we entered or exited the Zodiac, we'd use this handshake to assure our safety. 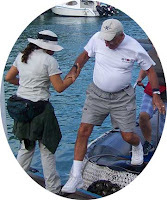 As you can see from the picture, the handshake involves clasping right hands of a naturalist or crew member and yourself. Even if the Zodiac were to move due to a wave, you have a firm grip and can safely exit the craft. Once onboard we were greeted by the staff, shown to Discovery Lounge, and offered a glass of champagne. Embarkation was completed in the lounge and we headed to our cabin to drop off our carry-on bags. Lunch was being served in Darwin's Restaurant on Deck 3. In my next post, I'll continue with the activities for the remainder of our first day onboard Celebrity Xpedition. Following lunch at El Crater we boarded our motor coaches for a short ride to the Middle of the World (la Mitad del Mundo)Monument. 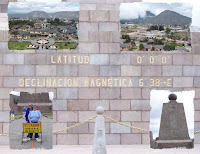 This famous monument marks the equatorial line: the centre of our planet earth: 0˚-0'-0" Latitude. It is possible to straddle both hemispheres at the same time. This 30-meter-tall monument, located 10 kilometers north of the city of Quito, Ecuador, marks one of the points where the equator goes through the country. 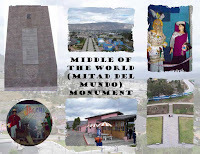 Inside the monument is a musuem about the indigenous ethnography of Ecuador. The first thing we did when we got inside the musuem was to take the elevator to the observation deck which offers spectacular views of the surrounding area. After touring the museum we did some shopping at the boutiques located on the grounds of the monument. A special Equator passport stamp is available at the museum. The stamp is also available at the Celebrity Xpedition hospitality desk at the JW Marriott Hotel. This stop concluded our Qutio tour. We boarded the motor coaches and returned to the hotel where we had some free time before our group dinner. After visiting Quito's historic Old Town, we boarded the motor coaches for a ride to El Crater Restaurant. This restaurant is built inside a volcanic crater and offers 360 degree views of the crater Pululahua. The Pululahua Geo-botanical Reserve is located 30 minutes North from Quito near the Mitad del Mundo Monument. Pululahua means "smoke of water" in the indigenous language Quichua. The Pululahua is an inactive volcano which its last eruption was believed it happened around the year 500 B.C. Fog was starting to roll in when we arrived at the restaruant so our guide suggested that we take our pictures of the crater before going inside for lunch. 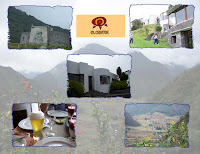 We took his advice and took several pictures which you can see in our Quito - El Crater Restaruant photo album. Our menu included choice of beverage including local beer or a blackberry smoothy made from locally grown fruit. The entree choices were chicken and beef along with potatoes and vegetables. We enjoyed our meal while viewing the crater from the restaurant's windows. Following lunch, we once again boarded our motor coaches for a short ride to the Equatorial Line Monument. I'll talk more about our visit there in my next post. Our day in Quito was quite lovely so far with Celebrity Xpeditions staff providing a very organized tour. Saturday, August 30th we began our day in Quito with a breakfast buffet in the Executive Lounge on the 9th floor of the JW Marriott Hotel. There were a selection of fresh fruits and juices which were so different than the ones back home. The pineapple really stuck out in my mind - it was a lighter color and very sweet. There also were a selection of hot foods and pastries. 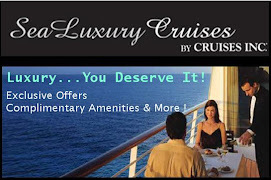 Celebrity Xpeditions pre-cruise stay includes complimentary use of the lounge. Besides breakfast, snacks and Hors D'oeuvres are served there later in the day. Coffee, tea, soft drinks, and bottled water are also complimentary. One glass of wine or local beer is also included. After breakfast we met the Xpeditions staff in the hotel lobby and boarded one of the four luxury buses that were chartered for our group. 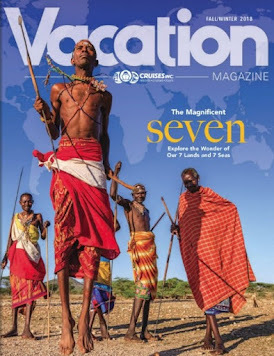 Celebrity Xpeditions staff really pays attention to details to make the cruisetour special. The bus seats were covered with the Xpeditions logo (pictured above). 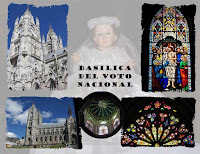 Our first stop was at the Basilica of the National Vow, (Spanish: Basílica del Voto Nacional) a Roman Catholic church located in Quito, Ecuador. The basilica stands on a steep hill to the northeast of the old town and can be seen from almost everywhere in the city. We only had enough time for a photo stop both exterior and interior. It is unfortunate that we didn't climb up the bell tower because it offers several vantage points of the city. The stained-glass windows in the church are outstanding, equaling those that we've seen in Europe for example. 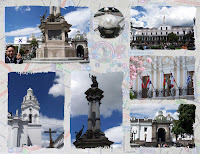 After a short bus ride, we arrived at Plaza de Independencia, the the heart of the Quito old town, which is walled by the four pillars of society, the Cathedral , Presidential Palace , the Archbishop’s Palace and the Municipal Palace. We entered the Presidential Palace from its north side, passing the guards. Two ‘toy-soldier’ guards, decked out in antiquated gold and blue uniforms, the Grenadiers of Tarqui, flank the main entrance. After getting pictures taken with the palace guards, we toured the exterior of the palace. We toured several of the other historic buildings in the old town area including the monestary, before boarding our coach for the drive to El Crater Restaurant for lunch. As we headed away from Old Town we got a glimpse of El Panecillo (the Virgin Monument) which towers over the city of Quito. 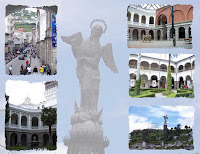 View our Quito Old Town album for many more pictures. Friday, August 29th seemed like any other morning as we got out of bed, took our showers, and got dressed. We went downstairs for some breakfast as usual. Sounds pretty normal - right? You are probably starting to wonder why I'm telling you about what appears to be a normal day. Did I mention it was my husband's birthday? Ok, but that still doesn't explain why I'm telling you this. I suppose you want some more hints, so I'll oblidge. If you were at our house, you would have noticed duffel type suitcases and backpacks lined up by the door. (I can't give you a bigger hint than that.) Now it's making sense, this must have been the departure day for a cruise. You guessed it! Since the end of July 2007 we had been waiting for this day to arrive. While aboard Celebrity Century on our North Cape cruise, we booked the Celebrity Xpedition 10 night Galapagos cruise. It seemed like an enternity since we made our reservation. 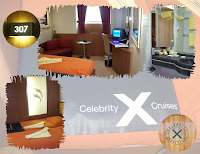 Celebrity Xpedition has a capacity of 92 passengers, so it is necessary to plan far in advance. There were several dates we could have gone but we selected the August 29th departure to take advantage of the Labor Day holiday. It would mean my husband could take one less vacation day. Also, we would be able to celebrate his birthday in Quito, Ecuador. 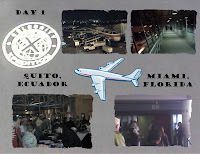 We had an early morning flight to Miami, Florida where we would change planes for Qutio, Ecuador. There was a slight delay in Miami, but for the most part, it was an uneventful travel day. Arriving in Quito, we deplaned and walked down a long corridor to baggage claim. The first thing we noticed was a sign that said slow down you are at an altitude of 2,850 m (about 9,350 ft). Since we were pulling a carry-on bag, we did take their advice. Celebrity Xpeditions staff greeted us as we arrived in the baggage hall. We completed the customs and imigration process and took our luggage to the waiting buses. Our guide gave us bottled water and explained that we had a short ride (about 15 minutes) to the JW Marriott Hotel, Quito. We arrived at the hotel and went inside to register. There were tables set up in the lobby to accomodate us. After checking in, we took the elevator to our room. The luggage was brought to our room shortly after that. Our hotel room was located on the eighth floor. We had a beautiful room with a view of the pool area and Quito. 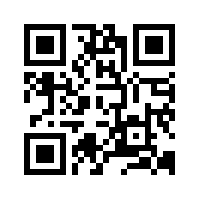 Click on the picture above or for a closer look, view my J W Marriott Quito album. The rest of the night we were on our own. We stayed in the hotel room, unpacked a few things, and watched some television. The next morning we'd have breakfast and embark on a city tour. August 29th wasn't a normal day for us afterall. We woke up in one continent, North America, and went to sleep in another, South America. This was just Day 1 of an amazing journey that I will share with you. When planning for your Galapagos adventure aboard Celebrity Xpedition you will learn that there are weight restrictions for your checked and carry-on luggage. Xpeditions arranges a charter flight on Tame Airlines from Quito to Baltra with a stop in Guayaquil for refueling. On this flight, you are limited to 30 pounds of checked luggage per person and one carry-on bag weighing 14 pounds or less. You can leave additional luggage at the JW Marriott Hotel in Quito. At first these restrictions sound daunting, but with some careful planning and packing you'll find this is not a problem at all. Assuming double occupancy, select two soft-sided (duffel type) bags for your checked luggage. We used bags that even had wheels for easy handling. Also use a backpack for your carry-on bag. This will easily fit under your seat on the plane. As I mentioned, you can leave additional luggage in Quito, so keep your pre and post-cruise clothes in the luggage you check at the hotel. In our case, we used a roller-bag carry-on for that purpose. We had purchased a few souvenirs in Quito, and we also left those at the hotel. 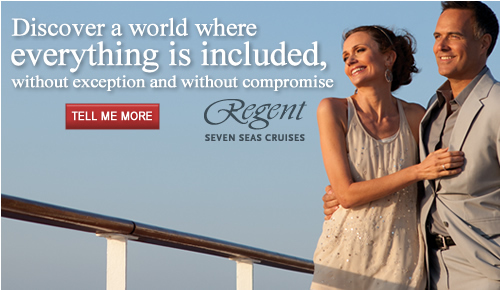 Attire onboard Xpedition is casual, so there's no need to bring dress attire for the evenings. We opted for the very casual evening attire - simply substituting long pants for our shorts. Some women did bring dresses along for the evening, but that isn't necessary. Don't bring formals or suits or you'll be out of place. Your clothes should include t-shirts, shorts, long-sleeve cotton shirt, sweatshirt, lightweight nylon or similar jacket, wide-brimmed hat, cargo pants, jeans, and rain gear (your waterproof jacket would also work), two or more bathing suits, Teva (or similar) shoes. Make sure to bring cameras, extra lenses, filters, extra film or memory cards, batteries, chargers, waterproof camera bag, disposable waterproof cameras or underwater camera, bug spray, and suntan lotion. If there are any medicines or toiletries that you like to use, make sure you bring ample supply since you can't run out to the nearest Walmart to purchase them during your trip. There is a small gift shop onboard where you can by logo wear, including the Celebrity Xpeditions wide-brimmed hat. Even though we had one with us, we did purchase another one. Each day you'll receive the daily guide of events. There will be suggestions about what to wear and bring on the excursions. Depending on the location, there may be certain colors you'll want to avoid wearing. For example wasps would be really attracted to bright colors and flowery clothing. Stick with white, dark colors, or beige and you should be fine. 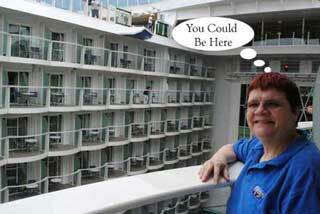 Check out my photo albums for ideas about what people wore on our cruise. Good shoes are a must. I already mentioned Teva shoes. We used Teva shoes and were very glad we had them for wet landings. In addition to your water shoes, you'll want either hiking boots or sneakers. To keep the weight down in your checked luggage, you might consider wearing the heavier shoes on the flight to Baltra. Each night the crew will brief passengers on the next day's excursions. It is highly advisable that you attend these sessions. There will be slide shows which will help you decide on the proper attire and select the tour that is best for you. There will be plenty of opportunity to go snorkeling and swimming during the trip. Xpeditions has wet suits and complete snorkeling gear. We have our own gear, but opted to use theirs. We were satisfied with the equipment, although some of the gear looked to be starting to show some wear. If you are advanced snorkelers, you might want to bring your own mask and snorkel (assuming you haven't hit you weight allowance yet). Luggage will be handled for you most of the trip. It goes without saying that you should have luggage tags on your bags. It doesn't have to be the Celebrity tags - any tag with your name will suffice from airport to hotel. After claiming your luggage at Quito airport, you won't see it again until they deliver the bags to your hotel room. You'll want to keep your carry-on bags with you. All your medications, cameras and other equipment should be packed in your carry-on bags. You don't need to worry about 3-1-1 restrictions when you travel to Baltra. You can even go through security with water bottles. 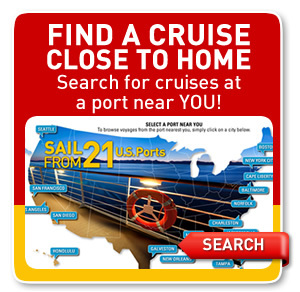 We are still working on our website for the cruise. There are several photo albums linked from the Photos page now. Additional resources will be added which will help you plan. Hopefully this answers most of your questions about what to bring with you on your cruise. Next time we'll start detailing our actual Xpeditions experiences. 2009 will mark the 200th anniversary of Charles Darwin's birth, the 150th anniversary of the publication of his work 'On the Origin of Species' and 50 years since the establishment of the Charles Darwin Foundation (CDF). What better time to visit Galapagos Islands which served as the inspiration for his great works? The Galapagos Islands contain a unique combination of land and oceanic ecosystems, with many distinct habitats found in each. The Galapagos are located at the point where major ocean currents meet and the islands straddle the junctions between several shifting tectonic plates. This area is truly unlike any other place on earth. The Galapagos Marine Reserve (GMR), one of the world's largest protected areas, has more than 2,900 reported marine species and over 18% of those live nowhere else on earth. 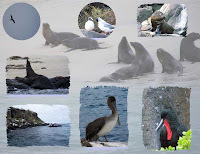 Some of the best known coastal animals of Galapagos include sea lions, fur seals, flightless cormorants, albatrosses, three species of booby, two frigatebird species, sea turtles, the marine iguana, and penguins. The Galapagos National Park Service works hand in hand with the Charles Darwin Research Station implementing their common goals of conservation and preservations of the natural resources with the Galapagos National Park and Galapagos Marine Reserve. The park service approves all itineraries of boats visiting the islands making sure that the tourism is distributed evenly throughout the islands. They also work as the licensing board for guides in the islands. We visited the Galapagos onboard Celebrity Xpedition. Celebrity Cruises is also heavily involved in protecting the GMR. You'll even have the opportunity to contribute yourself during your visit. Once you've visited the Galapagos, I'm certain that you too will want to see this land preserved for generations to come. 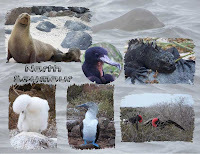 The Celebrity Xpedition guides were very knowledgeable making for a fabulous experience in the Galapagos. In my next post, we'll start to examine the trip in more detail. Some of my faithful readers are wondering what's happened to me the past month or so. Fear not, there's nothing wrong. 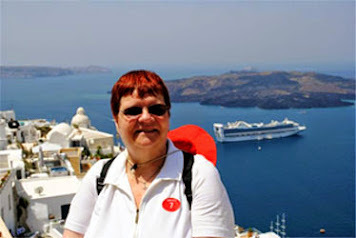 We've just returned from two fabulous cruises - Celebrity Xpedition to Galapagos Islands and Celebrity Mercury to Alaska. Despite the ability to keep in contact while onboard both ships, I opted to take a break from technology and completly emerse myself in nature all around me. As usual, we've taken lots of pictures which we are sorting through. We are finally at a point where we can start sharing details of the cruises and some pictures. I suspect this will be a long process since there are lots of pictures to go through. It's very hard to select just a sampling of pictures to share. Our Galapagos cruise ranks among our all-time outstanding cruises. Just look at the expression on my face above as we explored the Galapagos Islands via zodiac. Stay tuned for all the details. 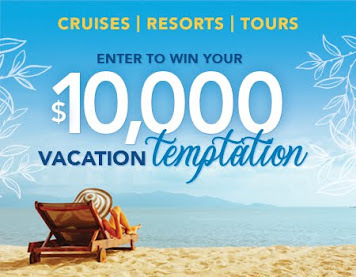 You can check our Cruise Vacations website - we've already posted links to some pictures on the Photo page (starting with the pre-cruise hotel stay in Quito). We highly recommend this trip if you are true nature lovers. Words can hardly describe the experience, but I will give it a try in upcoming articles.